The EU Emissions Trading System is reducing emissions, sparking low-carbon innovation, and growing up. Really. With 2012 shaping up to be the hottest La Niña year on record and global greenhouse gas emissions continuing to rise, initiatives to reduce global warming pollution are ever more critical. A new EDF report presents important lessons from the experience of the world’s first multinational carbon emissions trading system: the European Union Emissions Trading System (EU ETS). Jurisdictions as diverse as California, China, the Republic of Korea, Kazakhstan, and Australia are implementing, or are in the process of adopting, cap-and-trade policies to reduce greenhouse gas emissions, and all stand to learn important lessons from Europe. Began its pilot phase (Phase I) in 2005; the pilot phase transitioned in 2008 into the fully operational Phase II, which will end this year; Phase III will begin in 2013, and last through 2020 (though EU law already provides that emissions will continue to decline beyond 2020). Places strict caps on carbon dioxide emissions from power stations and industrial plants. Applies to about 40% of the EU’s total greenhouse gas emissions, rising to 43% as the ETS expands its coverage to include other industrial sectors and global warming pollutants. 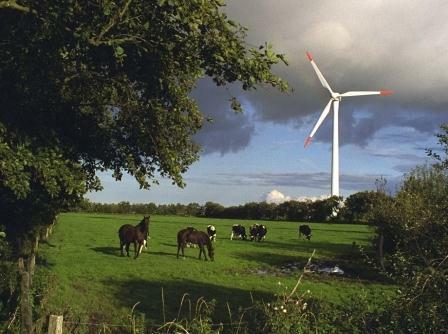 Aims to lower the total carbon emissions of covered sectors in the EU to 21% below 2005 emissions by 2020. Includes 30 participating countries, which account for 20% of global gross domestic product (GDP) and 17% of world energy-related CO2 emissions. As the EU ETS’s first full trading period (Phase II) comes to a close at the end of 2012, our report examines the results thus far of the world’s first carbon cap-and-trade experiment, and looks ahead to its future. Based on our analysis of the EU Emissions Trading System, EDF has identified six major results from the EU ETS’s experience, and developed corresponding policy recommendations. The report’s Executive Summary includes additional details on each of the following lessons learned. 1) The EU ETS has achieved significant emission reductions at minimal cost. As shown below and on page 8 of the full report, the data suggest that the ETS has succeeded in reducing emissions beyond what would be expected from the recession alone, even assuming an emissions growth rate 1% less than the growth in GDP (represented by the dotted business-as-usual line). ETS sector emissions declined a further 1.8% in 2011, according to recent estimates, while GDP increased approximately 1.4%. However, verified 2011 emissions data will not be available until mid-2013, and thus the graph does not depict the likely drop in 2011 emissions. The EU has achieved this emissions-cutting success at much lower-than-expected cost: according to some estimates, just 0.01% of Europe’s GDP, and that’s without considering the economic benefits of emissions reductions. 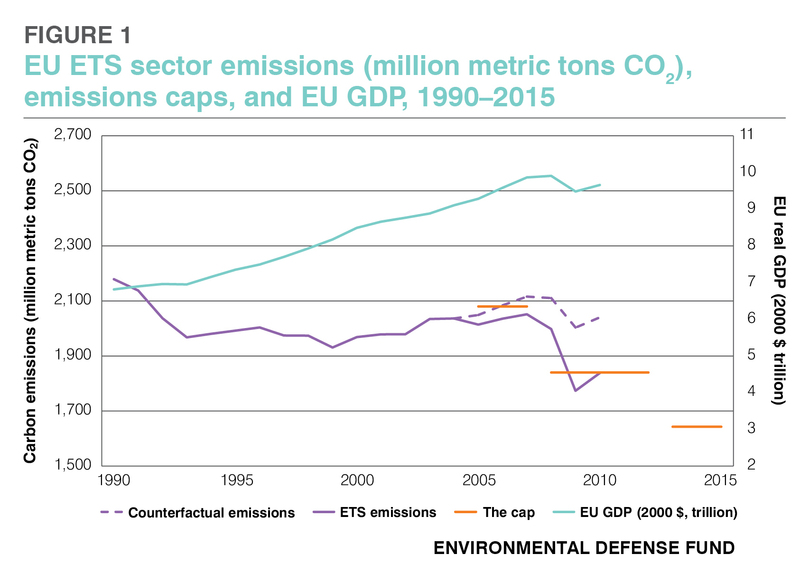 EU ETS sector emissions (million metric tons CO2), emissions caps, and EU gross domestic product (GDP), 1990–2015. Recommendation: Emulate the successful design of – and improvements to – the EU ETS, including its focus on the environmental integrity and enforceability of the emissions cap, to unleash the proven effectiveness of cap-and-trade in stimulating low-carbon innovation. Recommendation: Stimulate long-term emission reduction investments by maintaining a predictably declining, enforceable, science-based cap on carbon. 2) Although over-allocation of allowances and a sharp drop in their prices occurred during the program’s pilot phase in 2005-2007, the policy stability created by longer-term targets subsequently led to durable investments in reducing emissions and deploying low carbon strategies. Recommendation: Base emissions caps and resulting allowance allocations on measured and verified historical emissions, rather than on estimated or projected emissions. Recommendation: Provide a predictable long-term policy environment that allows banking of allowances between trading periods. 3) Windfall profits occurred in some member states but can be avoided using a variety of policy tools. Recommendation: Establish appropriate regulatory oversight of public utilities, and auction some or all allowances. 4) Reforms have improved the elements of the EU ETS that allow emitters to tender credits earned from projects reducing emissions in developing countries (“offsets”), but further reforms would be useful. Recommendation: Adopt reforms that allow international offset credits only from jurisdictions that have capped some portion of their emissions, or only from least-developed countries. Recommendation: If linking to other nations’ emissions trading programs, do so preferentially with nations that adopt caps or limits on major emitting sectors. 5) The EU ETS has made significant progress in preventing any recurrence of the tax fraud and theft of allowances that occurred during the program’s earlier years. Recommendation: Establish effective governance and regulatory bodies, as well as preventive electronic security systems, to adapt to evolving cyber attacks and other market security threats. 6) Companies and entrepreneurs have responded to the ETS and its complementary policies with a diverse range of profitable investments in low-carbon solutions. Recommendation: Institute an ambitious cap-and-trade system to encourage business to think creatively about reducing greenhouse gas emissions. The EU will further expand the coverage of the EU ETS in 2013 to include additional greenhouse gases and additional industrial sectors, including the aluminum and chemical industries. Additionally, even though the EU ETS’s Phase III ends in 2020, the cap on emissions will continue to decline after that – by 1.74% per year – which provides the critical longer-term certainty needed to spur investment in emissions reductions now. Nonetheless, a suitable set of complementary policies and measures is essential if the EU is to achieve its aspirational emission reduction target of 80% below 2005 levels by 2050. A more ambitious EU ETS target for 2020 or 2030 would help achieve the EU’s long-term reduction goal. 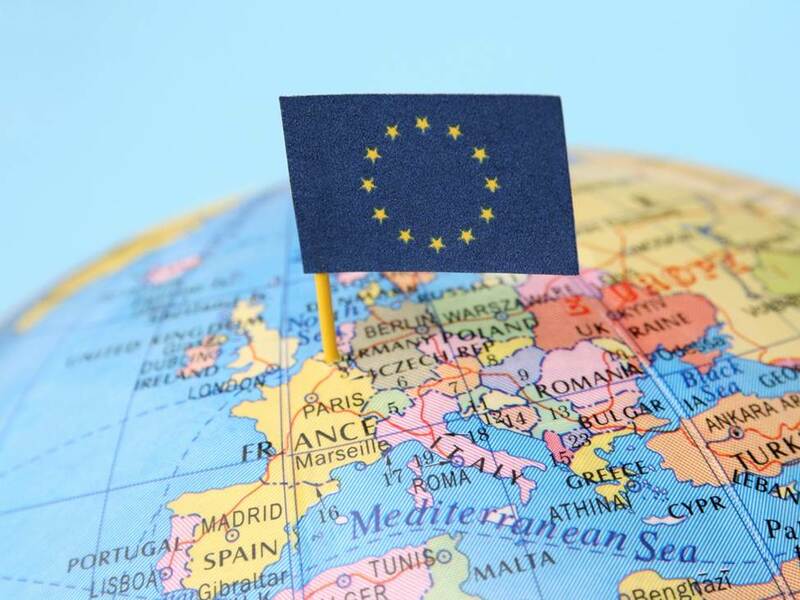 Current discussions in Europe include proposals to tighten the EU ETS cap further, not only to strengthen emission reductions, but also to stimulate economic growth. Perhaps the most important lesson the EU ETS experience provides is that regions, countries and states can benefit from a learning-by-doing approach to cap-and-trade. Any design flaws and weaknesses of various policy tools are often difficult to anticipate, but can be corrected over time as experience warrants. With its success and durability now attracting the attention of other nations and jurisdictions that seek to link their carbon trading systems to the EU’s, the EU ETS offers a unique opportunity for other regions, nations, states, and even local jurisdictions that are considering such systems to learn from its experience and continue to build on its success. This entry was posted in Europe, News. Bookmark the permalink. Trackbacks are closed, but you can post a comment.